A wooden house is one of the best solutions in terms of environmentally friendly, affordable, and convenient housing. But he will have these characteristics only if certain rules are followed when building and finishing, both external and internal. The walls of a wooden house are different from stone and block - they require a certain humidity, temperature, moderate mechanical loads. In addition, living material is characterized by constant gas exchange with the external environment - finishing materials must freely pass air. Not all types of finishes have the required properties, choosing what to sheathe walls in a wooden house inside, you need to know what materials the wood is combined with, and which ones are better not to use. 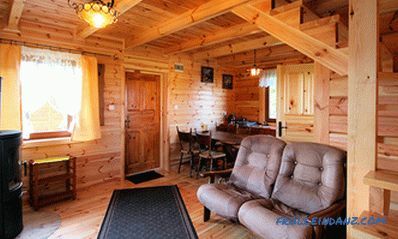 In this article we will try to give comprehensive information about the features of the interior decoration of the house of wood. Unlike block and brick buildings, houses made of timber or logs give a noticeable shrinkage. This fact can not be ignored in the performance of finishing work and the installation of communications. The house accepts its residual size upon expiration of a certain period after completion of installation. Rafters and walls in a year. ordinary timber and log cabins - at least 1 year. 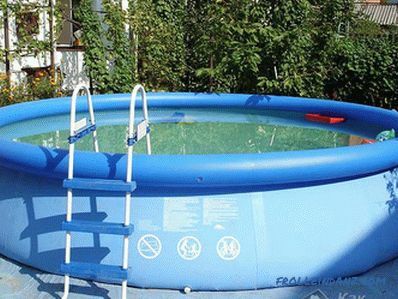 The rate of shrinkage depends on many factors, the most important of which are humidity and air temperature in the area where the house is built. It is recommended to begin work after caulking joints between logs or a bar. 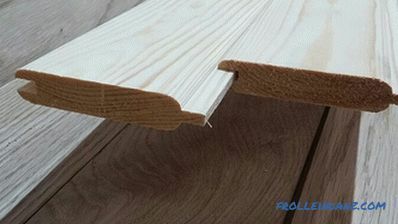 In many cases, when carefully laying a timber, there is no need to trim it with other materials from the inside. It is enough to cover the walls with azure, paint or varnish for interior work or water-based impregnation. The natural beauty of the tree itself has excellent decorative properties. House from a bar that has not been subjected to additional interior decoration. 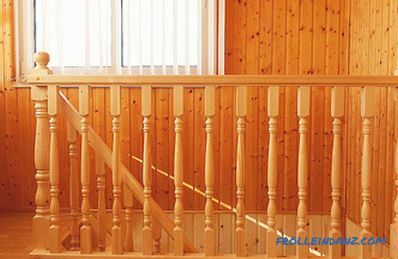 One should not forget when finishing and using anti-mold and antifungal preparations and fire-fighting treatment of walls and other wooden structures. Today, almost all manufacturers of paint and varnish materials have in their product lines an environmentally safe, effective means allowing to carry out all types of processing without special expenses. But with not too smooth walls, the desire to change the interior or redevelopment of the house walls are closed with other materials of different types. When deciding how to sheathe a wooden house inside, you should focus on materials with similar properties to natural wood. This will avoid the conflict of materials in terms of vapor permeability, thermal expansion, moisture absorption, thermal insulation and other basic properties. A number of finishing materials are made from natural wood - lining and cork panels. They are the perfect solution. But among these types of finishes, there are quite a few varieties and modifications. Choose from them should be the option that most corresponds to the design of the house, interior style and financial capabilities of the owner. In most cases, used as lining, as one of the most convenient to install and inexpensive materials with excellent decorative properties. The finishing material received its name from the boards that were used for wooden carriages. They along the entire length of the side faces are equipped with spike / groove locks, which determine the tightness and strength of the joints. From the natural wagon covering, in fact, only these locks are preserved. The lining itself lost in width and thickness, but won in appearance. 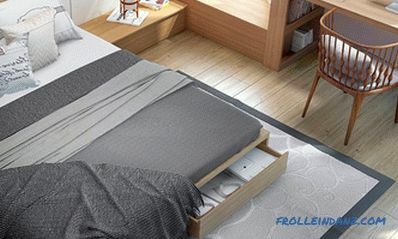 There are several types of lining used for interior decoration. 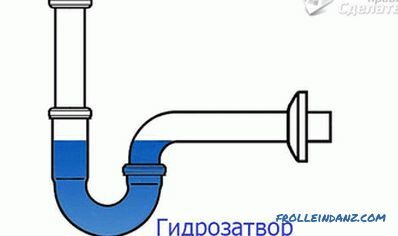 All types can be divided into two main types - regular and eurolining. The fact is that the European standard DIN 68126/86 is more rigorous to the shape and size, as well as the quality of surfaces. Therefore, it is accepted to call Euro-track any high-quality material, regardless of the place of its manufacture, if only it complies with DIN requirements. They mainly concern the moisture content of the material, the smoothness of surface treatment, the length of the tenon and the depth of the groove. The lining of the eurolining is 12.5, width - 96 mm (with a spike). Also on the back of the boards should be cut ventilation grooves. 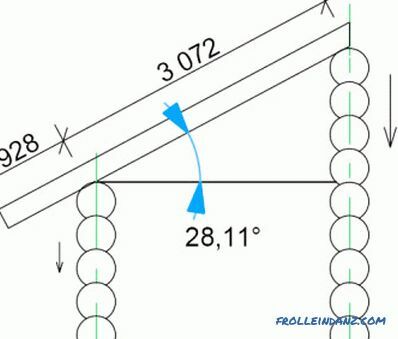 Pile on the front side, trough groove grooves or deviations in the spike thickness are not allowed. The connection should be made easily, keeping the spike as tight as possible in the slot.In case of any temperature deformations and changes in humidity, the lamellae should not diverge by an amount that allows for the emergence of through-slots. In any case, lining maintains the integrity of the coating. # 1. Different lining profiles. In terms of the appearance of the finished wall, various modifications of the wall panel may differ significantly. This is determined by the shape of the profile of the outside. For example, in traditional eurolining, a longitudinal chamfer is selected near the spike, which may have a different shape. It is perfectly visible on the wall in the form of a relief seam. Softline. 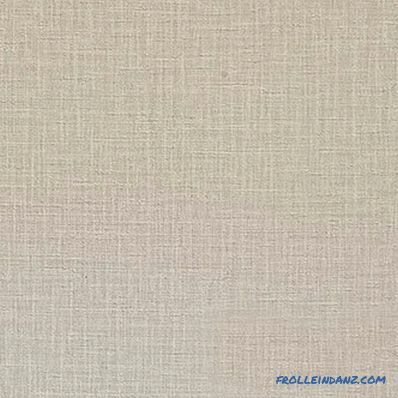 If the longitudinal chamfer is rounded, the lining is called Softline - one of the most common types of finishing material. Its popularity is determined by the absence of sharp edges, which eliminates or reduces the likelihood of burrs and chips. Such lining is used most often for the finishing of baths and saunas, but it is also appropriate in the corridors, hallways, living rooms and other residential areas. Calm. The next most popular type of eurolining is “Calm”. It is completely devoid of chamfer and after installation the seams are not so noticeable. Of course, they exist, but their relief is very weak. According to the appearance of the wall, sheathed "Shtil" take the form folded from a natural bar. The thickness of the slats is increased to 25 mm and the finish with this material has increased strength. Blockhouse. Also imitation of a more durable material, this time - a rounded log. Often the front surface has such processing precision that with skillful installation it is impossible to distinguish the wall panel from the natural log even on close inspection. Most often, this type of finish is used for decorating facades, but inside the house it is quite appropriate. Landhouse. This type of wall paneling belongs to the elite class. It differs in a special way of processing the front surface with the help of mills of various configurations, which allows to give the wall a very decorative look. Some collections are made using woodcarving, which allows for the finishing of exquisite interiors. True, the thread is made by the method of extruding the sweat with a thermopress, but decorativeness does not suffer from this. American. It has a rather unusual triangular profile in which the spike smoothly passes into the front part, without the slightest protrusion. The American-faced wall looks exactly covered with siding. So, as siding is an American invention, then lining received its name associated with this continent. Double-sided lining. An original type of material with two front surfaces. This gives a wider choice of pattern and texture when finishing the responsible areas. However, this loses an important property of the wall paneling - moisture resistance and the absence of thermal deformations. There are no ventilation channels on the lamellas, which limits the use of this type of lining in damp and unheated rooms and outside. A specific feature of the production of lining is that all processes are performed on the same machines and equipment, and the products are sorted into classes after. Lamellae are selected by the number of defects - the presence of knots, tar spots, biological lesions, discoloration and other indicators. Extra lining is characterized by the complete absence of knots and cracks. Mounted on the wall without any further processing. Class "A" allows for no more than 2 - 3 knots and small chips per 1 m length of the board. 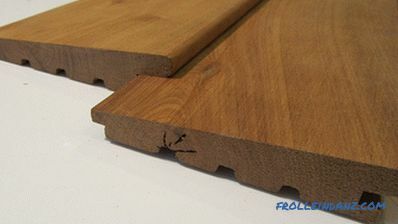 Face cracks are also allowed, the resin content is not higher than 10% (for conifers) and minor deviations in colors, also within 10% of the total number of boards in the package. On the front side of the class “B” lining boards, you can find knots that have fallen out with a diameter of up to 2 cm, resin pockets and some ground surface. Up to 5% of the lamellae may have traces of damage from the activity of insects, some color defects are allowed. Class “C” lining - the rest of the boards rejected when sorted into the upper classes. But they can not be considered unsuitable for use - on barely noticeable areas of the wall or when covering complex configuration of architectural details, where a large number of short boards are needed, such lining is quite useful and will save material class "A" or even "Extra." 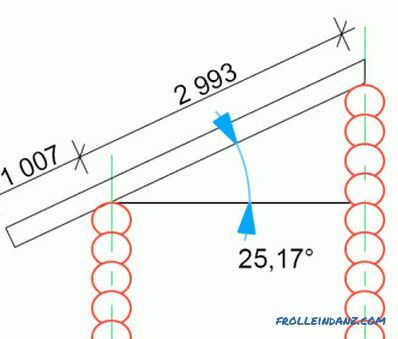 For lining of all classes, deviations in geometrical dimensions are allowed for a length of no more than 50 mm, a width of up to 1 mm and a thickness of no more than half a millimeter. # 3. Of which wood lining is better. 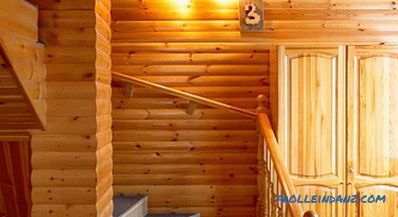 When deciding how to trim a wooden house inside, it is often necessary to decide from which wood to choose the wall paneling. The fact is that this type of material is made from almost any tree and finding oak for sale, for example, lining is no more difficult than coniferous. The only thing in the price. It is conifers that are most popular - spruce, pine, larch, cedar. Each of them has its own characteristics. The spruce is very soft, which allows you to give the clapboard any relief. 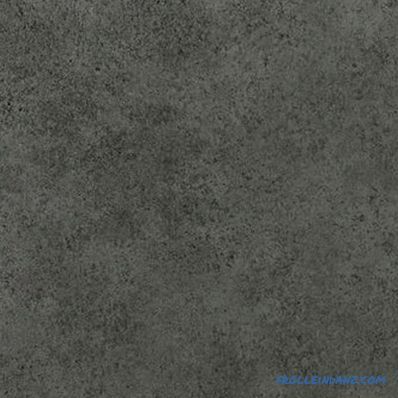 The surface is very smooth, with a beautiful texture, almost without patterns. The disadvantages include a high level of moisture absorption, the lining of spruce must necessarily be treated with water-repellent preparations. Pine - closest to spruce, but lower in density and quite tar-like. Drops of resin can be released even after several years of operation. But due to the low price and prevalence of the material, as well as ease of processing, it is no less popular. 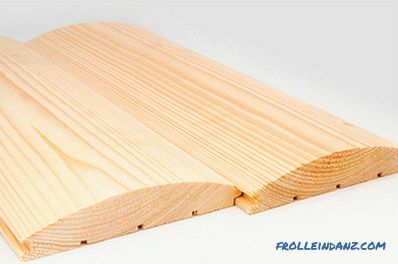 Larch is an elite material of high strength. Even with significant mechanical loads does not crack and does not form a splinter. 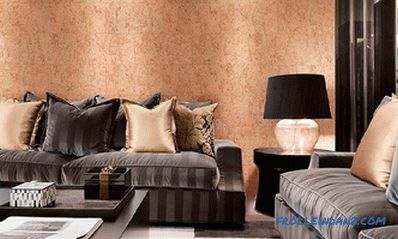 Very beautiful, with a characteristic reddish-brown color and well-manifested pattern. Over time, the strength of the material increases, as does the resistance to insects and fungal infections. The only disadvantage is the price, but you have to pay for the quality. 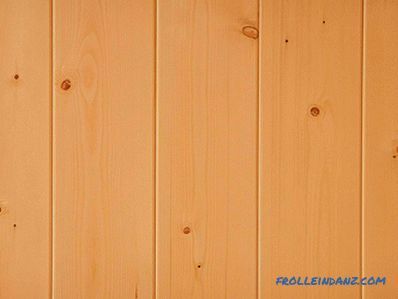 The wall lined with larch will last 50–100% longer than pine. 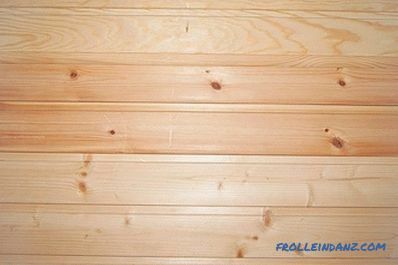 Cedar is a very dense, resinous wood, which has a characteristic odor, low thermal conductivity and high strength. The presence of natural flavors frightens off many insects, in particular, mosquitoes. Very interesting color and pattern. Hardwood lining is no less popular than coniferous. Most often for the manufacture of lining used oak, linden, alder. For baths and saunas aspen is indispensable. Hardwoods are used primarily for interior decoration. For exquisite interiors, rocks with bright patterns and their own color are chosen, for example, oak, cherry, walnut (rarely). Linden and alder are more often used in common rooms, kitchens, corridors, hallways. They are perfectly tinted for more expensive breeds, although, for example, alder, have their own characteristic color. 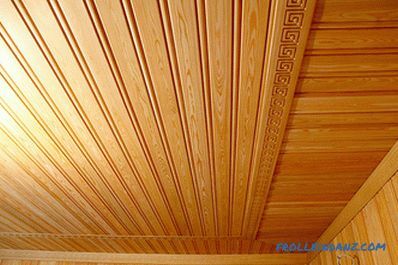 For decoration of small fragments of walls and ceilings, lining of exotic wood from other continents is sometimes purchased. It is quite expensive, but it can create a stunning visual effect. # 4. Sizes of lining. The standard sizes of the slats may vary from different manufacturers, but in most cases they are quite close. The length of the lining is in the range of 0.3 - 6 meters. Lamella thickness - within 12.4 mm, and width 96 - 100 mm. But there are other sizes. When installing the trim, it is necessary to calculate the amount of lining and purchase products from one batch so that installation does not arise. But combinations of various types of lining are possible. This sometimes allows to get very interesting effects. 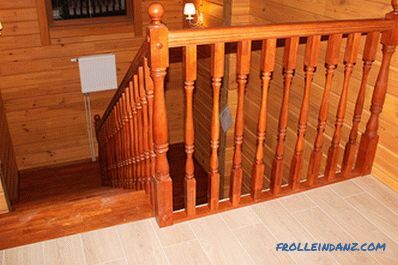 An excellent solution for interior decoration of a wooden house is a cork. The panels of this natural material are very decorative, easy to install, but somewhat expensive, compared with clapboard. Their main advantages are lightness, environmental friendliness, a wide range of colors and patterns. Also cork panels are extremely hygienic - they do not absorb moisture, do not accumulate dust, and are very easy to clean. When using fragrant detergents, even a trace of smell does not remain. 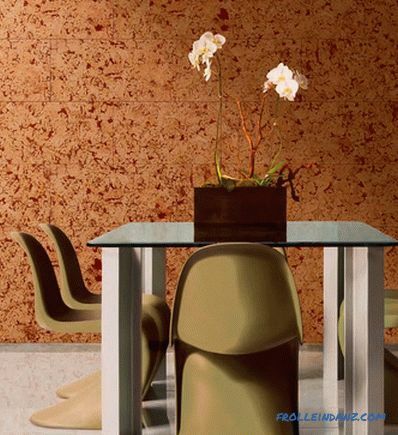 Cork finishing materials are made in the form of panels and individual tiles of different sizes. This allows you to select the desired configuration for wall covering a large area in spacious rooms, and rooms of limited size. Installation is performed using special glue. 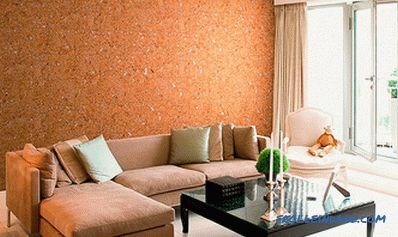 In addition to wooden wall paneling and natural cork, other materials of artificial origin are used for wall decoration, which include a certain percentage of synthetics and natural materials. components. 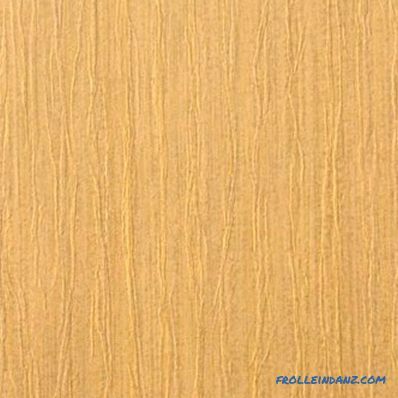 One of the most common are wallboard fiberboard - fiberboard. It is produced by the method of pressing crushed to the state of individual fibers of wood and natural binders. 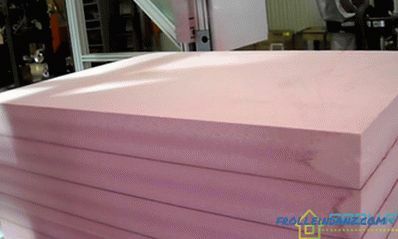 With sharp changes in the temperature, the fiberboard does not crack or deform, at least significantly. When heated, it does not emit volatile substances that can cause irritation or allergies. Sheets are quite thin and large in size. This allows you to install them on the bearing walls and partitions. 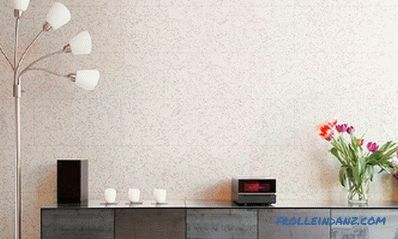 A wide range of surface finishing options makes it possible to choose a panel for any interior. Moderately priced panels are sometimes so well made that the imitation does not differ from the selected real material either in appearance or in strength. MDF resembles fiberboard, but more dense. Such plates are made from more crushed wood raw materials on the basis of a lignin binder - a product of high-temperature distillation of wood raw materials. After pressing, durable panels are obtained with a very smooth surface that can be painted, washed, covered with wallpaper, laminated. Laminated MDF panels are produced in the form of individual tiles up to 1x1 m in size, large in area for sheets up to 3x1.5 m in size or long lamellas resembling lining. Panel thickness 7 - 12 mm. The panel is attached to the crate or directly to the wall if its surface is sufficiently smooth. 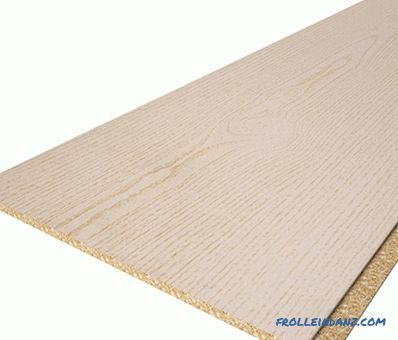 Like ordinary fiberboard, MDF panel is absolutely safe in an environmental sense. 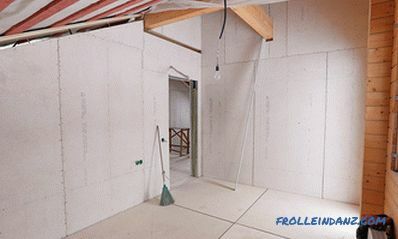 Due to its structure, drywall is just as appropriate in a wooden house as it is in a stone or brick house. 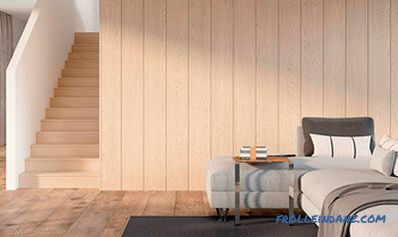 Having covered the wooden wall with the wooden plasterboard, one can be sure that it will be in optimal conditions for humidity and temperature, excessive moisture will not accumulate in it, or conditions for the appearance of mold or rot will not be created. But in order to insure the installation of drywall, it is necessary to treat the wood surface with antiseptics and long-acting fungicides. 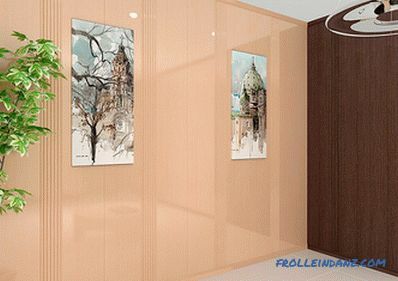 The surface of the gypsum plasterboard is puttied and painted, as in an ordinary house, it is possible to install ceramic tiles or another type of decor used in stone houses. 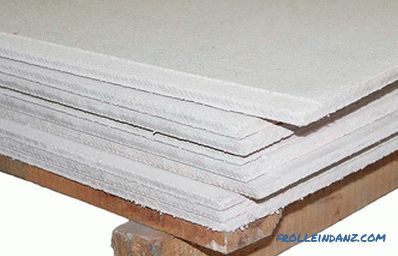 Gypsum Fiber Sheet (GVL) is a material made from crushed cellulose and gypsum. GVL is homogeneous in its structure and is produced by the method of dry pressing. The most optimal areas of application of this material are places where there are increased requirements for fire safety. In addition, this material is used for the device partitions and wall cladding where there are high requirements for protection against shock. 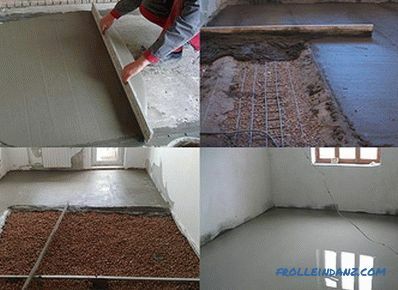 Usually, one of the types of material in all rooms is used for finishing the house - it is more convenient for further processing. But there are options for combining the finishing methods, for example, lining in the corridor and on the landing and MDF or cork in the rooms for general use, plasterboard with ceramic tiles in the kitchen and bathroom. 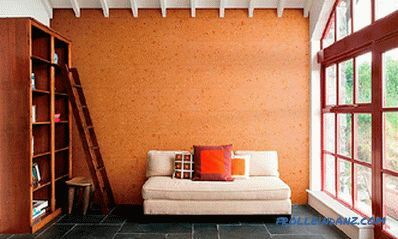 There are plenty of options for decorating walls in a wooden house inside. You need to choose the one that best suits the situation and financial capabilities. But there are a number of materials that are undesirable for internal purposes of a wooden house for various reasons. What materials are not recommended for use in finishing a wooden house due to their low environmental friendliness? There are several types of finishing materials that have excellent strength properties, high decorative properties, moisture resistance and resistance to fungi and mold but not suitable for use as interior decoration. The reason is that during their production, binders based on formaldehyde and other resins are used, which, when heated to room temperature, emit even a small but noticeable amount of vapors that adversely affect a person. If at the external lining of such materials the walls do not pose a danger - most of the harmful components evaporate into the atmosphere, then in a closed room their concentration can reach a dangerous level. It is not recommended to use them even in technical and utility rooms. 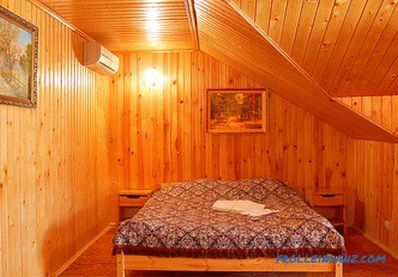 The choice of materials for interior decoration of a wooden house is huge. In this work, it is necessary to follow not personal assumptions, but recommendations of specialists.